At a macro level, the U.S economy is on a hot streak. Now into month 100 of the current economic expansion (the 3rd largest in recorded U.S. History), the unemployment rate is flirting with 4.10% as of November 2017, in sync with extremely low jobless claims not seen since the 1970’s, and consumer confidence is up. It’s clear that this is a job-based recovery, based on employment metrics and modest income and GDP growth, not a bubble being fueled by a run-away mortgage market and speculative housing valuations. It seems rather, that the extraordinary housing price recovery since the recession causing the House Price Index for the United States to pass the 2007 peak in 3Q 2016, is a result of simple economics: supply is not keeping up with demand. 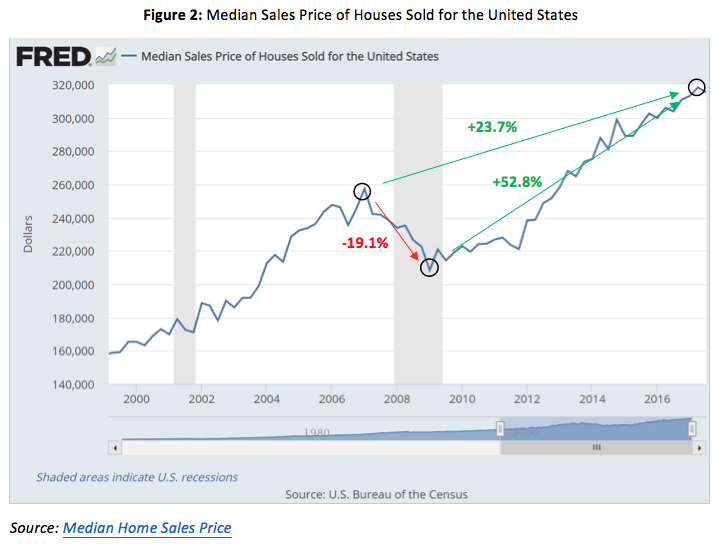 From the 2007 peak through the trough in 2009-2011, Median Home Sales Price declined approximately 19.1% by 1Q 2009 to $208k and started to recover slightly. Median Family Income lagged, but still dropped 8.5%, bottoming out in 2011 at $65k. 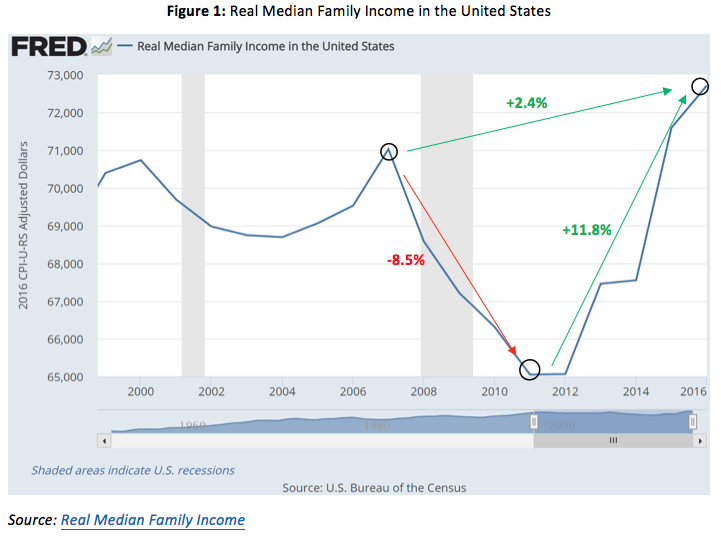 Since then, median family income has recovered 11.8% to $72.7k, just 2.4% above the 2007 peak of $71.0k, while home prices have rebounded 52.8% to $318k, now 23.7% above the 2007 peak of $257k. As a result, affordability increased dramatically as home prices dropped faster than income until 2012, and then compressed as prices soared while income barely returned to previous levels. The National Association of Realtors Housing Affordability Index shows median family income as a percentage of the income needed to qualify for the median-priced homes with a 20% down payment. Recently, this metric has been steadily declining to 160 over the past few years, meaning that the median family income has 160% of the income necessary to qualify for a conventional loan with a 20% down payment on a median-priced existing single-family home. By comparison, in 2006-2007 at the peak of the bubble, the average family had just enough income to qualify (100-110). The bottom (2011-2012) told a much different story as the average family had 200%+, or double the income needed to purchase the median-priced home. This decrease in affordability is interesting however since it coincides with a decrease in U.S. Homeownership. As of 3Q 2017, only 63.9% of U.S. households were owner-occupied, a steady decrease from the record high of 69.2% in 2Q 2004. This suggests that the price increase is not being driven by too many people buying homes, but instead due to the lack of homes. More people are renting as the fewer amount of homes available become more expensive. On average, homes are more affordable than they were 10 years ago, but household formation (demand) is outpacing the creation of housing units (supply). Let’s examine two 8-year periods, 2001 through 2008, and 2009 through 2016. From 2001 through 2008, the number of households grew 8.3% by 8.9 million from 108.2 million to 117.2 million. During the same stretch, 13.3 million housing units were completed, leading to a drastic oversupply. This is interesting because fundamentally, price should not have gone up. However, loose credit standards and the demand for mortgages on the secondary markets fueled those home purchases when income growth was not keeping up. If you look back at Figures 1 and 2 above, family income grew only 3% from 69k to 71k from 2002 through 2007, while median home sales price grew 53% from 170k to 260k. Post-crash, from 2009 through 2016, the number of U.S households grew 7.4% by 8.6 million to approximately 127.0 million, but only 6.4 million housing units were completed, an increase of just 4.9%. Chart 1 and Figure 5 provide more detail below. 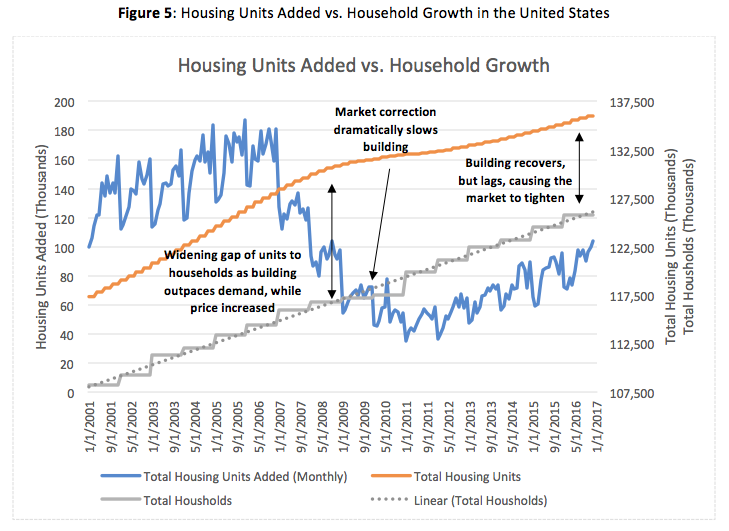 If we look at the U.S. Housing market in terms of household occupancy, 92.2% of the households were occupied at 1/1/2001 and decreased to 89.7% by 1/1/2009 as the delivery of housing units (buildings) outpaced household growth (people). Occupancy has since returned to 92.7% as household formation increased steadily and household completions have lagged. The composition of housing units delivered has also changed, favoring apartments. From 2001 through 2008, 83% of the units completed were privately owned 1-unit structures (single-family homes) compared to only 71% post-crash (Source: Housing Completions – 1-unit). The market is responding to a decrease in homeownership and catering to an increasing number of renters. Months supply of existing single-family homes – a measure of how much inventory is on the market at current sales rates – was 3.9 months as of October 2017 and has been decreasing for years. Compared to a ‘normal’ level of 6 months, which represents a healthy balance of supply and demand, this further indicates that there are not enough homes to go around. 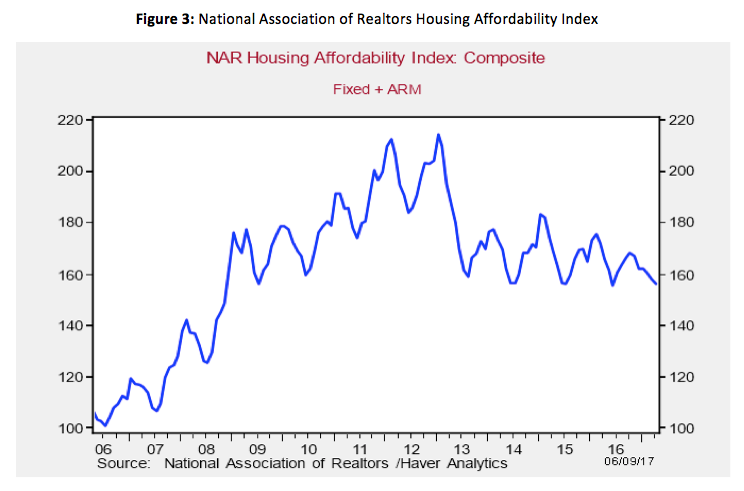 The U.S. is not experiencing a housing bubble, we are in an affordability crisis. Cycles don’t die of old age and the next recession is not likely to be caused by a collapse of home values. The inability for household completions to keep up with household formation coupled with an increased preference for rental product and moderate-income growth explains the increase in home price, a decrease in homeownership, and downward pressure on affordability. This is further exacerbated by tighter lending standards, rising student debt levels, low household savings rates, and the nature of infill markets, topics I plan to dig deeper into in future posts. All things considered, the American dream of owning your own home is being pushed further out of reach for many Americans, but there are some solutions out there. Stay tuned.